Digital Summit is coming to Chicago and you can join the conference to learn the latest tips, trends and digital marketing strategies. 55+ in-depth sessions & workshops will not only help you stay ahead of the latest digital trends but also provide you with practical takeaways you can immediately apply to your marketing strategy. At Digital Summit, you will be able to learn directly from the brands and thought leaders who are making an impact on the world’s economy — now and into the future. Get under the hood and stay ahead of the strategic curve with Facebook, Google, Airbnb, Instagram, BuzzFeed, Reddit, Salesforce, and more. It’s the all-important “hallway track.” There are hundreds of seasoned marketers, strategists, designers, and more (just like you!) to mingle and connect with. You never know what inspiration, partnerships, or business deals you’ll leave with after two days at Digital Summit. You can also try and make it a team event, plus use the conference as a lab for team building and max impact on your bottom line. Team discounts and perks are available! You’ll leave with access to the conference’s speakers’ presentation decks. Want to go deeper and be the hero of the office by bringing back more enhanced content? Ask about ticket packages that include access to audio + presentation slide recordings. 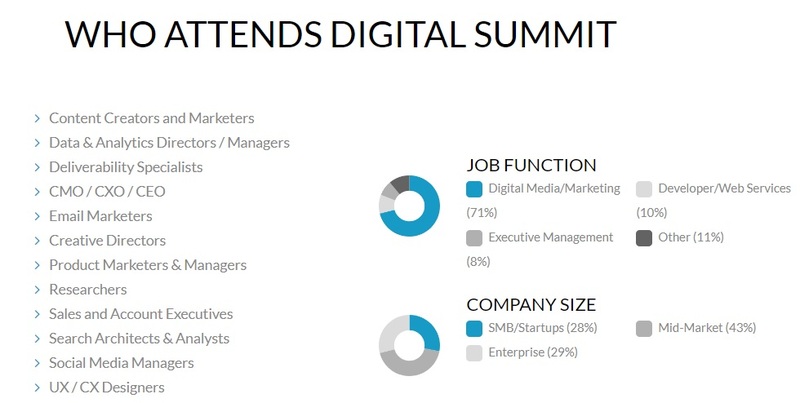 Attendees at Digital Summit are influencing the future of their company’s digital marketing and strategic success. The event’s attendees are the movers and shakers across the digital marketing spectrum. They come from a wide variety of companies and organizations — including national brands, agencies, service providers, technology pioneers, media, B2B providers, associations & nonprofits, startups, and much more.